Malur Seloth, a Dunmer witchblade, is the steward of Winterhold. He can be found in the Jarl's Longhouse or on a bench in front of The Frozen Hearth. Because of his race, the townsfolk assume that he has connections at the college. As such, they treat him with fear and respect. To keep up appearances, Malur wants to get his hands on the Staff of Arcane Authority, which belongs to Nelacar. He will ask you to steal it for him during the related quest and will reward you with speech training. Malur Seloth spends most of his time wandering around the Jarl's longhouse. He will rarely do anything besides wander around the longhouse. His first deviation from his duties at court will come at 10am, at which time he will head outside to rest on a bench outside of The Frozen Hearth. He will remain outside until high noon, at which point he will return to the longhouse for lunch. Once he finished eating at 1pm, he will continue to do random tasks around the longhouse until 3pm. At 3pm he will head outside to exterior of the inn once more to spend another two hours. He will return inside the longhouse for the final time for the day at 5pm. Malur will wait around for an hour inside the court until 6pm to have his dinner. After eating, he will continue to perform various activities until 10am the next day, when he will head outside to The Frozen Hearth to repeat his schedule. 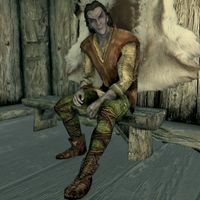 Malur Seloth will provide numerous comments about his lifestyle of avoiding trouble and about how people think he has some connection to the College of Winterhold should he be approached: "My job is to serve the Jarl, not waste time talking with travelers." "I don't really know anyone at the College. I guess everyone just assumes I do because I'm a Dunmer." "It turns out that if people think you're some sort of secret wizard, they'll let you get away with a lot." "I'm trying to do as little as possible. You're getting in the way of that." If Winterhold is controlled by the Imperial Legion, Malur will also provide a comment about the new housecarl, Thonjolf: "Thonjolf is convinced I've got some connections at the College, so he goes easy on me." His favor quest can be initiated by asking him about what he does around Winterhold. He will reply to the query about his job by saying: "Me? Nothing. And I hope to keep it that way. The Jarl is convinced I have some connection with the College, so he goes easy on me. Maybe you'd like to help me keep up appearances? Old Nelacar has a mage's staff in his room in the Frozen Hearth. It'd be good to have that staff in case the Jarl starts wondering if I actually have a real connection to the College." Accepting the quest will have him say: "Thanks. I'll be waiting for it." Rejecting the offer will instead have him curse you: "Daedra take you, then." Once you return with the requested staff he will thank you for your service and raise your Speech skill one level: "This should come in handy. Here. Let me show you a few tricks I've learned about buttering up royalty." Due to Malur's dedication to avoiding work, a fellow member of Jarl's Court should the Imperials take control of the town, Thonjolf, will wonder aloud why he is tolerated by the new Jarl: "I'm not one to complain, but I'm not sure why Kraldar insists on keeping Malur Seloth around." Thonjolf will also converse with Malur Seloth about a task he needs done, only for Malur to deny him almost immediately. Malur: "Doesn't really matter. Thanks, but no." Malur is the only member of the Jarl's Court in Winterhold that will never be replaced, whether or not the Stormcloaks or the Imperial Legion are in power. He shares a surname with Evul Seloth, who lives in Raven Rock, but there is no indication that they are related. Malur Seloth should sleep between 10pm and 9am, but he cannot find a bed. As such, he instead spends that period wandering around. This page was last modified on 21 April 2015, at 21:52.